Dolores Park: A Historical Landmark? 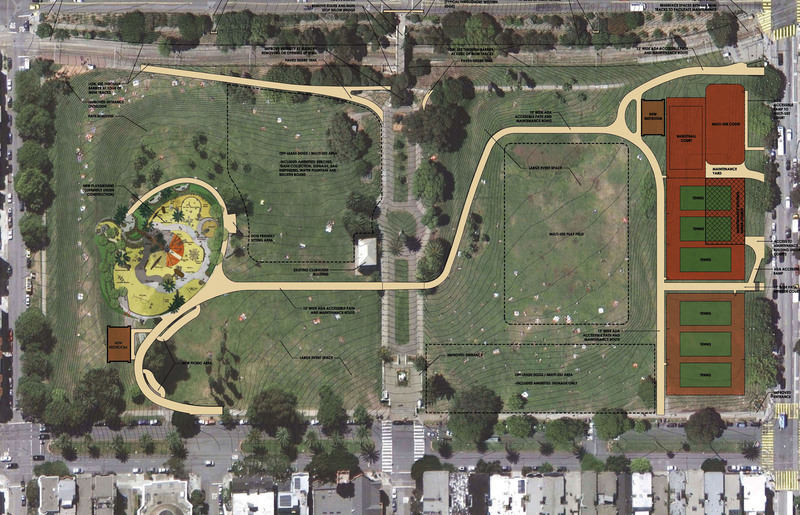 The draft of the plans for Dolores Park, as of the last community input meeting. A year after community meetings began on the $7.9 million renovation of Dolores Park, a new wrinkle has developed. As it turns out, the park is old. I mean, we knew the park was old. We knew this even though, on any warm day, the park is covered with a thick layer of humans too young to remember what a tape deck is, lying in the sun like beached seals. But according to a draft of a Historic Resource Evaluation Report commissioned by the San Francisco Recreation and Park Department, Dolores Park has seen such minimal alteration since its design, in the early 1900s, by famed park superintendent and master gardener John McLaren, that it is actually eligible to be included in the National Register of Historic Places. What this means for plans to renovate the park — the new bathrooms, the new maintenance shed, the new bike polo court, the new ADA accessible pathway, the old clubhouse that many community members expressed the desire to blow up — remains to be determined. Meanwhile, the report itself makes for fascinating reading. It appears to catalog the history and origin of every lamp post, Muni stop and slanted patch of dirt in the park. Those 1,600 refugees who lived in the park after the 1906 earthquake? They paid rent to stay there. The kids’ playground? It’s shaped kind of like a wading pool because it was one, from 1909 through the 1920s. That enormous bell? Gift from the Mexican government, circa 1966. That level ground beneath the tennis courts? Thank the Barnum and Bailey Circus, which in September 1905 struck a deal with the city in which it agreed to — at its own expense — dump hundreds of carloads of clay mixed with sand into the wetlands in the northern area of the park, in exchange for the privilege of staking its circus tent there. That’s right: Fixie meadow is built on circus sand. If the park was actually listed in the National Register of Historic Places, any changes would need to be cleared with the state Office of Historic Preservation. An archaeologist would need to be brought in to consult on the project. Any plans that involve digging up sections of the park have already resulted in anxiety among some parties involved in the renovation — the park covers territory that was, at various times, a Jewish cemetery, an Ohlone settlement and the southern end of the original Mission Dolores. There are rumors that not everyone buried in the park was dug up and moved to Colma, and the Advisory Council on Historic Preservation has very strict guidelines [PDF] on dealing with building sites that also happen to be burial sites. What constitutes damaging the park’s original design? The path. Or, as as Lewis describes it, “the road.” At the most recent community meeting, the path was described as 10 to 12 feet wide, and completely necessary to comply with the Americans with Disabilities Act. The reasoning behind the specific numbers was this: On a 12-foot path there’s room for a truck and a person in a wheelchair to pass each other safely. On a 10-foot path there’s room for a wheelchair and a smaller vehicle, like a Toro lawn mower. Ruppert confirms that the ADA does require a new path that would connect most of the park’s major elements. But the guidelines are flexible, she says. The path won’t extend up the steep slope that surrounds the children’s playground (the section of the park commonly referred to as “gay beach” or “the fruit shelf”), because an ADA path up a slope that steep would require so many switchbacks that it would be a fundamental alteration to the park. And it’s true, Ruppert says, that the path only needs to be 4 feet wide, though a path that narrow would need to widen to 5 feet every so often, to provide wheelchairs with a space to pass each other, or to pass people with canes or walkers or seeing eye dogs. “It would be a kind of funky path,” she says. At 5 feet wide, the path would not need to widen any further, and at 6 feet wide, it could also serve as a platform for extras like benches and water fountains. Both Jake Gilchrist, project manager for the Dolores Park renovation, and Eric Anderson, manager for the park itself, are on vacation and could not be reached for comment. Much of the current renovation design, says Ruppert, would probably meet historic preservation guidelines, since the bulk of the project involves restoring what is already there, and standards are looser for restoration than they are for new construction. Placing the new maintenance shed underneath the tennis courts would go over well, since the preference is for new buildings to be hidden from view. Also fascinating is the report’s description of prior attempts to alter the park. After World War II, San Francisco became obsessed with organized sports and recreation centers. At one point, Dolores Park nearly got a swimming pool, and at another, a baseball diamond. Each time the additions were fought back by neighborhood residents who said they liked the park just the way it was. A year ago, at one of the first meetings about the Dolores Park renovation project, that was the overarching theme: Don’t change it. Don’t change it. Don’t change it. Each time, Rec & Park seemed to react with disbelief, like a suitor who had arrived at the door with flowers only to find that the object of their pursuit was already madly in love with someone else. Someone marshy, and a little trashy, and — let’s just push that metaphor to its breaking point — someone with really insufficient bathrooms. It’s because of those cranky stick-in-the-mud types that the Mission has a park that has barely changed shape since the early 1900s. If it becomes a historical landmark now, it will be very much in keeping with this newly discovered history. The more things change, the more they stay the same. Heather Smith covers a beat that spans health, food, and the environment, as well as shootings, stabbings, various small fires, and shouting matches at public meetings. She is a 2007 Middlebury Fellow in Environmental Journalism and a contributor to the book Infinite City. John Mclaren was not a Landscape Architect he was a horticulturist and a good gardener. 4 foot wide path is the minimum width of an ADA path, minimum as in for one person with disabilities. At times Delores Park may have a few dozen people on that path, a 4′ path is just stupid w/ these kind of volumes. All your going to get is eroded dead lawn at the sides of this path because people will walk on it. It is a damn shame that the entire park has to be chopped in half to provide a road to comply with ADA. Its actually ridiculous. There need to be some limits on the ADA. Its insane to change every structure in the nation to comply with a regulation that servers an infinitesimally small population. How about escalators everywhere for fat people? How about every park having step-ladders for little people…. Its just ridiculous. Wheelchairs can access the park via sidewalks. Time cannot be stopped in its tracks, but there is no consideration in the arsenal of preservation of how its effects should be managed, how the ‘preserved’ could stay alive, and yet evolve. Is it possible to Rec and Park for violating and lying? I hope someone is documenting this story in a non-fiction narrative style a la John McPhee. Can anyone point to the actual ADA language governing these decisions? I always hear ADA this and ADA that, but what does the law actually say? I think it’s very important that everyone have access to the various public amenities — stores, bathrooms, muni, etc — but there are certain amenities — like grassy open areas — that by their very nature are going to be tough on wheels. what does the law say? why not smooth the whole thing over and pave it? from a different perspective, we have more than enough paved surfaces in the mission; it seems like a real loss to pave over more of our scarce public grass. it’s certainly already possible (minus the stairs) for someone on wheels to get from one side of the park to the other using the sidewalk that goes all the way around it. These are the current standards: http://www.ada.gov/2010ADAstandards_index.htm. The language that people kept using to describe ADA accessibility is that the park provide access to “major elements” – so there is room for debate as to what that access would look like and what the major elements of the park actually are. To clarify, while it is correct that ADA requires only a 4′ path (with a pullout every 200′), please note that you’re also NOT allowed to combine a maintenance ROAD with ADA access. Otherwise a handicap person can be injured by one of the maintenance trucks. This information has been verified by a respected architect who specializes in historic preservation and ADA compliance. In addition, putting a 10-12′ ROAD through a park that has been clearly identified as an historic resource (by an unanimously adopted historic survey and professionally researched HRER) goes against CEQA. By the way, Rec & Park’s original proposal was for a 14’ ROAD. (Event) and Criterion C (Design/Construction), with a period of significance from 1905 to 1966. Francisco for use as a park, and ending with the installation of the Mexican Liberty Bell plaza. The park retains integrity of location, setting, design, materials, workmanship, association and feeling.